The long-awaited first installment of Henry's History has finally arrived and, advertising hype aside, it is an event. Beginning with the call from Richard Nixon in 1969--ironically, while Kissinger was lunching with Nelson Rockefeller--that brought him into national prominence, and ending with the signing of the Paris accords on Vietnam in 1972, this segment inevitably centers on the Vietnam War, with side-trips to Moscow and China. Much attention will be paid to the nuts and bolts of negotiations between the U.S. and North Vietnam, the beginnings of détente, the secret mission to Peking, and the Mideast maneuvers of the period, as well as to Kissinger's profiles of colleagues and of Nixon. But one of those profiles may provide a clue to this maze of words; in speaking of then-Secretary of Defense Melvin Laird, Kissinger notes that Laird would raise a host of issues in order to camouflage the main issue on which he wanted to prevail in inter-departmental wrangling. Kissinger's appreciation of Laird's bureaucratic acumen may be reflected in the massive scale of this book, fully 1500 pages in all. But the layers of meetings, memoranda, and reflection can't hide its basic value; this is one of the great documents of today's amoral, antidemocratic political manipulation. Kissinger claims, for instance, that he originally intended to maintain the structure of the National Security Council as he found it, but that Nixon, suspicious of the Foreign Service, insisted on strengthening the NSC as his instrument. 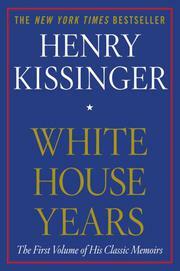 Later--in reference to presumed disagreements between him and Nixon over the Christmas bombing of Hanoi in 1971--he claims disingenuously that "a Presidential Assistant soon learns that his only strength is the President's confidence"; but the intervening 1450 pages have shown us a Kissinger who knew how to institutionalize his power, and who, in the end, outmaneuvered even Richard Nixon. Kissinger's amorality is apparent from the start, as he never questions the propriety of accepting a position with the Nixon Administration after extolling the virtues of Rockefeller; the only question was which position to go for. Later, he could claim that "Cambodia was not a moral issue." But the greatest example may be Chile, where Kissinger justifies covert actions against Allende because his election was based "only" on a plurality--and, in any event, "was a challenge to our national interest," solely on the basis of his Marxist ideology. For Kissinger, values are ideology, power is truth. Though he wrings his hands over the "poor Cambodians" and those killed in Vietnam, his commitment was to American international "credibility" and effectiveness. For those not snowed by the erudition and charm, then, this is a fundamentally important book.